The dust has settled, wounds healing, and almost cleaned up from this years running of the HCR Racing King Of The Hammers UTV race! Can we go back now? Even with a podium finish in 2011 and a couple DNFs, every year the weeks after this race have been spent realizing what could have been done differently, but more importantly, what can be done to make next year better. I have built up a handful of RZR’s over the years but I would say up until I arrived at Hammer Town this year, I maybe had 100 miles driving experience in any RZR. 90 of those were in the dunes. I’ll save the long story about my new found appreciation for the RZR XP 900 for a review thread. It performed beyond my expectations with a little help from folks like UTV Inc. with their full rollover, safety, UHMW skid plate protection, and build of the entire car. Cognito Fox Shocks, Fox Shocks Regan Woelfel and crew, ITP TIRES, Wicked Bilt Power Steering, Lonestar Racing Heavy Duty Tie Rods and Hi Clearance Radius Arms, and more! While I was on the lakebed, I came up with this idea to store my spare parts where they were easily accessible, and where I needed the weight. Considering we were to ascend most of the rock sections, I knew that keeping the front end down would be necessary without having my co-driver exiting the car. I knew just where to go. First stop was the Torchmate CNC plasma cutters tent. I spoke with their guys and within 3 hours they made me a steel plate to mount onto my exoskeleton bumper bars. In the mean time, I went over and saw my friend Mike at the Axia Alloys trailer for some trick billet mounting brackets. Axia makes a modular aluminum bracket or mount for just about any application you could imagine. Race day morning was unusually calm. The weather was perfect. My dad even showed up unannounced all the way from Colorado! All of my prep work was in order, all we had to do was eat breakfast, suit up, and remain calm. Typically on race mornings we start earlier and I’m pretty wound up. Not this morning. I knew what we were up against, and knowing that it could chew us up and spit us out was enough to keep me focused. We were fifth off the line on the inside of the corner. When the green dropped we made easy work of the car next to us and set off into the desert and straight up a hill. Not an incredibly gnarly trail, but just enough to get your attention. It wasnt until this point in my 2 month venture to this race that I realized, in a Polaris RZR I have no idea what I’m doing. Do I need low for this? IDK, will this car shift on the fly? Why cant I see over the hood? Oh, better rethink that idea….. This went on for a few minutes while I got my wits about me. I put it on cruise and delt with traffic as necessary. 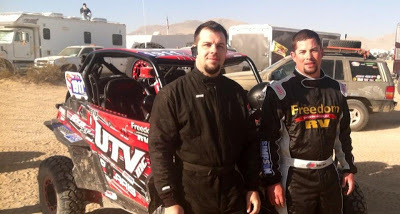 Josh and I settled into a swift pace after about 2 miles of tight winding terrain, and into what some seasoned trophy truck racers have described as some of the roughest desert they’ve ever seen. I’d say the first 48 miles went as expected. We weren’t slow by any means but still played it safe. We had a couple funny moments around RM 40ish where Jon Crowley (Second place finisher) Casey Currie and I would be racing side by side through brutal whoops, where we’d almost just pace one another as there was no way to go faster. I’m talking a 60′ wide “road” we’ll call it, and you simply couldn’t go any faster unless you’re the likes of Branden Sims. There’s no slowing this guy down except for broken parts and boiling shock oil. lol He would beat the field to the sand hill by minutes with a broken axle, and blown shocks. Next would be Mitch Guthrie (The King) some guy in a RZR4 (very fast in the desert) Jon Crowley, Myself, and maybe another I’m forgetting. I came into the Sand Hill RM48.5 behind Jon Crowley and I was fine with that. The last time I ran this section was in 11 and we went down hill. Sims would be stuck in the middle winching up, while Crowley and I went around him. I followed Crowley who made very short work of this hill, but I would have to winch. We made it into the main pit in 5th place. The car was rock solid and didn’t need much more than a tire check and fuel. Josh and I took food and water, backtracked back through the checkpoint that our beloved “race ops guy” (love ya Blake Rennie) told us to bypass, and back into the desert for lap two which would be the most challenging section of the course. From this point and into the rocks, our only traffic would be Every Man Challenge guys and a broken UTV. To my surprise, the EMC guys that I encountered were very cordial with us. Most heard the horn and let us by. Going into aftershock one offered us a push, and another co-driver actually ran over and helped us push. My hats off to you guys for your good sportsmanship! Some folks at that section were telling us that Currie had already taken that route and that it was illegal. This lead to much frustration and confusion. I waited, and waited, and waited. My co-driver was up helping the cars through as I was passed by 2 UTV’s. A third, my friend Chris Barnett of American Rock Rods, I would cut off from dropping back in before me. We made short work of Aftershock and we were on our way into Highway 19 and 20 with Barnett on our tail and now running 7th place. Around RM 78 on what looked to be a simple obstacle, I would take the wrong line and break a front axle assembly. Barnett would follow us through and also break a front axle assembly. Crowley’s only part failure was also a front axle assembly, “at the bottom on 19” and I would be willing to bet it was this very same obstacle. Knowing…Errr, let me rephrase that….. Having some sort of idea of what we were up against with 19, and 20, I decided to walk to Remote Pit 2 for a front axle. Get your shots in now. All those spare parts and it would go down like this? Har Har. I was told it was one mile. It was every bit of three and no walk in the park. I radioed to pit and when I got there Coastal Racing had lent my “Race Ops Guy” a front axle for us. “Race Ops Guy” had the axle, a couple pb&j sandwiches, and a Gatorade for us which really made the walk back quite nice. I radioed to Josh that we had the part coming and by the time I had returned he had the car disassembled and ready for the new axle. Josh reassembled the car quickly but there was only 2 hours left before the race would be called. I knew that we didn’t have time to finish in the allotted time period, and decided that saving the car for next year and greeting those who finished was a good way to end the day. All in all, I think we had a good day. 2 months ago I didn’t even have a car, a crew, a co-driver, nada. Needless to say, the title of the King will one day be mine and the way I see it, I have about 354 days to dial in my program! Thanks for reading! Please visit my sponsors web pages and we’ll see you on the lake bed in 2014. Can I sign up now? Ultra4racing, International Side By Side Association, HCR Racing, Side By Side Performance, Regan Woelfel Project Engineer Fox Racing, Torchmate, Dave Cole, Jeff Knoll, Damon & Brittney Cardone, Mike Lasher, Blake Rennie, Andrew Shultz, Josh Hounslow, Devin Murphy, John Angal, Bob Nolan, Dan Fisher, North American Kajukenbo, Nick Wilson, La Familia, Slangin Sound and Tint, and more. Thanks to Freedom RV who had us riding in style!